Commvault, a recognized global enterprise software leader in the management of data for cloud and on premises environments, today announced the appointment of Sanjay Mirchandani as President and Chief Executive Officer and member of the Board, effective immediately. On February 21st, 2018 ComSource hosted its first “Data Protection at the Dome” event at the Syracuse University. ComSource customers, partners and future clients gathered before the Syracuse/North Carolina basketball game for presentations from ComSource's CEO Kevin Hanlon, President Jim Carrick and Commvault's Joe Kohler. Key topics of discussion included: Data Protection: Backup & Recovery, Optimizing Cloud Strategies, Data Virtualization & Infrastructure Management and Enterprise Applications. 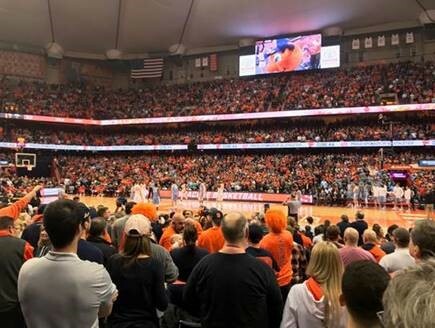 The event was followed by a Syracuse Orange basketball game at the Carrier Dome versus ACC rival North Carolina Tar Heels. Although Syracuse lost by 4 points in the nail-biting game… ComSource, our partners and customers considered the evening a success nevertheless. Stay up to date with the latest technology news, customer events and more on the ComSource website here. To inquire about future events, please email info@comsourceny.com. Our Partner, Commvault, recently wrapped up their third quarter of fiscal year 2018, and the results are in. The data protection company achieved record quarterly revenue of $180.4 million, an increase of 8% year-over-year, and 7% sequentially. Software and products revenue was $81.4 million, an increase of 4% year-over-year, and 13% sequentially. Services revenue in the quarter was $98.9 million, an increase of 12% year-over-year and 3% sequentially. Commvault links their impressive quarter results to partnerships, events and new service launches. Commvault held their annual customer event Commvault GO, this past November in Washington D.C., which grew significantly from the previous year. On Nov. 7, 2017, Commvault launched Commvault Endpoint Data Protection as a service to simplify and streamline the backup and recovery of corporate data stored on laptops, desktops and other devices. On Oct. 25, 2017, Commvault was named a winner in the Disaster recovery/business continuity solution category at NetworkWorld Asia's 2017 Readers' Choice/Rising Star Awards. On Oct. 17, 2017, Commvault launched Commvault HyperScaleTM Appliance and Commvault HyperScaleTM Software, two powerful, cloud-ready data infrastructure offerings that provide customers with on-premises simplicity, elasticity, resiliency, flexibility and scale for managing secondary data. ComSource offers customers a number of solutions from Commvault, including data protection, cloud and infrastructure management and retention and compliance. To find out more about how Commvault and ComSource work together, click here.